Kissito exists for the Betterment and Care of Human Life. A purpose simple yet so broad would allow for many activities but our purpose is not to be all things to all people. We focus on solutions for complex and challenging problems. (“so called wicked problems in the Social Sciences”) Health Systems, Aging in America, Poverty Elimination throughout the world, Nutrition and Agriculture, and Preserving our Environment and Natural Resources are all examples of the areas where wicked problems exist, and where Kissito seeks to find sustainable solutions. We seek sustainable solutions which have an immediate and lasting impact on the lives of people. We are highly collaborative often acting as a catalyst for the work of others. All of our work is encouraged to be shared, so collectively we might accomplish more good for more people. We often say: Our mission will be done when we are no longer needed. Our core values of Integrity, Passion, Excellence, and Respect (“IPER”) are real and have daily meaning in our work. 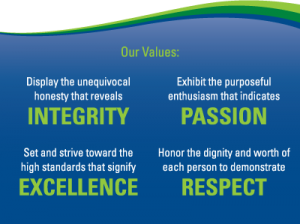 We seek to engage with people aligned with our values and purpose.